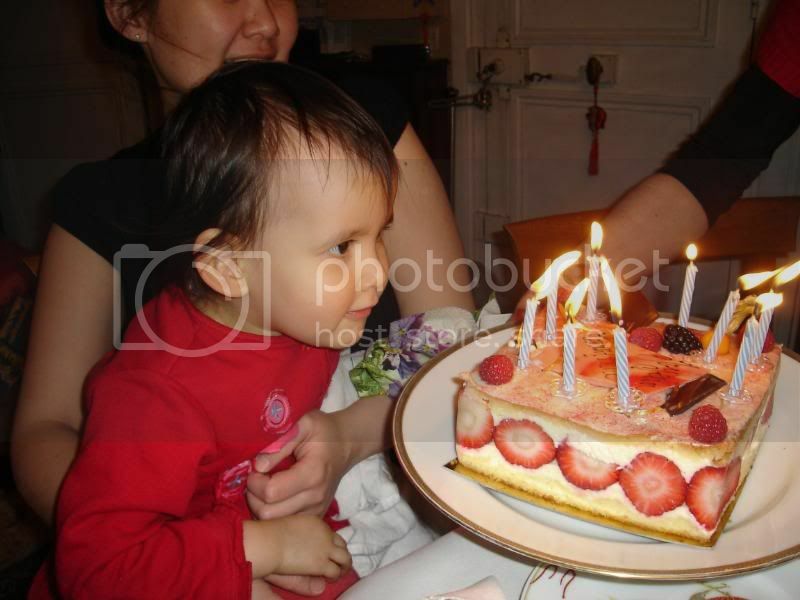 Across 2 Cultures - Cross-Culture Parenting and Lifestyle Blog: Happy 2nd Birthday Laetitia! Wow, what a day of celebration my little darling had today. In fact today is the latest Laetitia has ever gone to bed. At almost 11:30pm!!! Her normal bedtime is before 9pm. Well, today is a celebration for her and of her. I shall warn you first that this post is probably the most picture heavy of all the post so far. Well, let's get started shall we? It started right in the morning after she woke up. 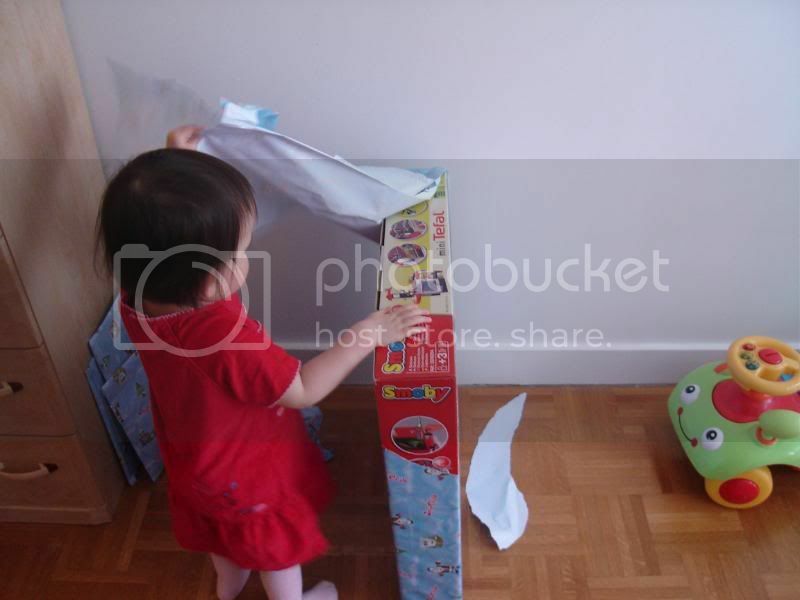 She was allowed to open her first set of presents, from her mamou and papou (grandparents). 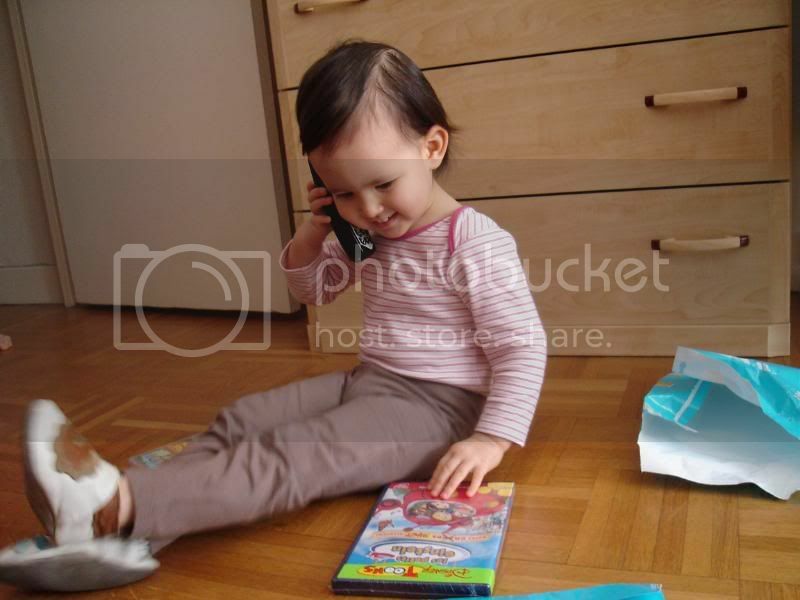 Thanking them over the phone for her presents. She was absolutely delighted. 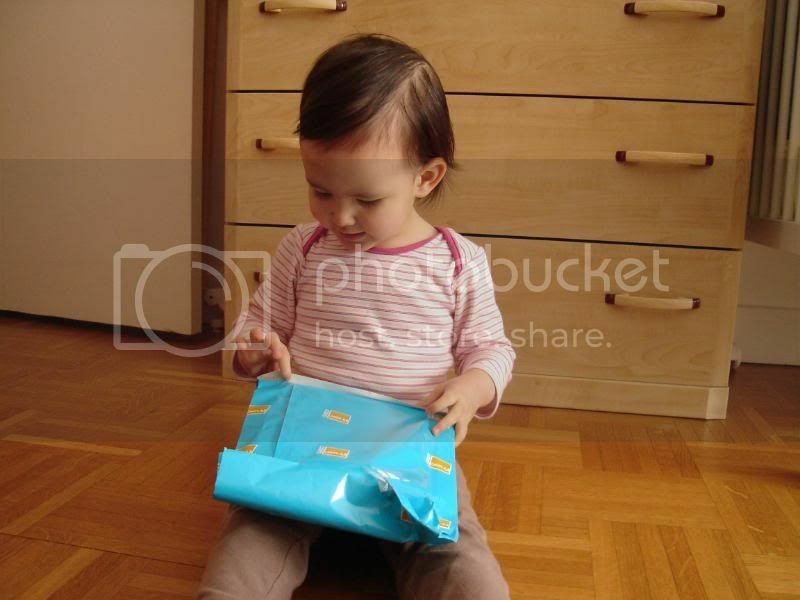 Here she is opening her birthday card from her grandparents. She looks oh so cute in the pose. 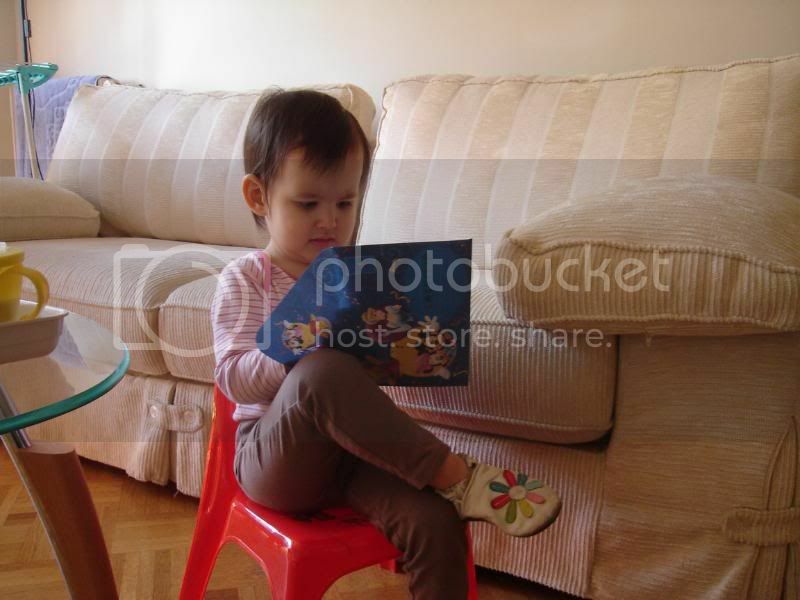 Then she's off to have breakfast and watch her Little Einsteins DVD. After breakfast, it's time for to open another present. This time, a present from Tatie Manu (her aunt, Etienne's sister). It's a cleaning unit with a vacuum cleaner! She had so much fun with it. Check out this photo. I love it. She is working hard together with her papa. I think we have a good helper around the house. 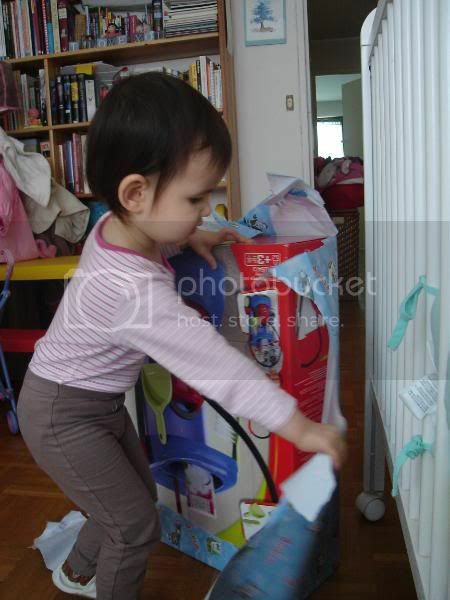 And just before I took her out for a little walk to the grocery store, she decided to open more presents. She picked the presents from Auntie Eileen this time without any prompting from either of us. And what did she get? An umbrella! (And a world map too but I did not open the map up for fears that she would tear it just as she had been tearing at the wrappers). Once she had the umbrella, she refused to leave it behind when we were going out. 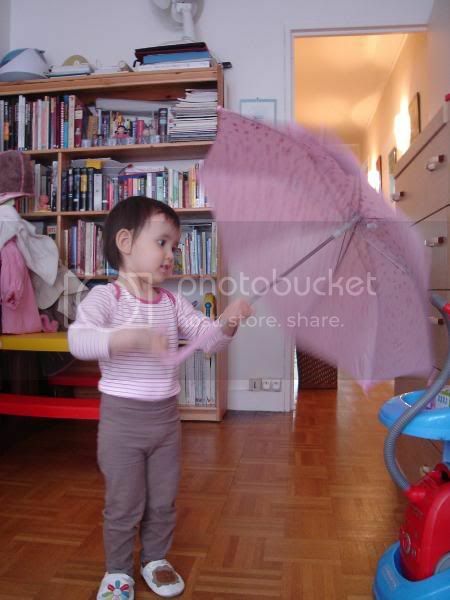 So, even though it was a bright and sunny day outside, she was walking around with her umbrella. It was sweet though. After that we came home, she had lunch and it was time for her nap. While she took her nap, I took the opportunity to finish up the decoration on her cake. 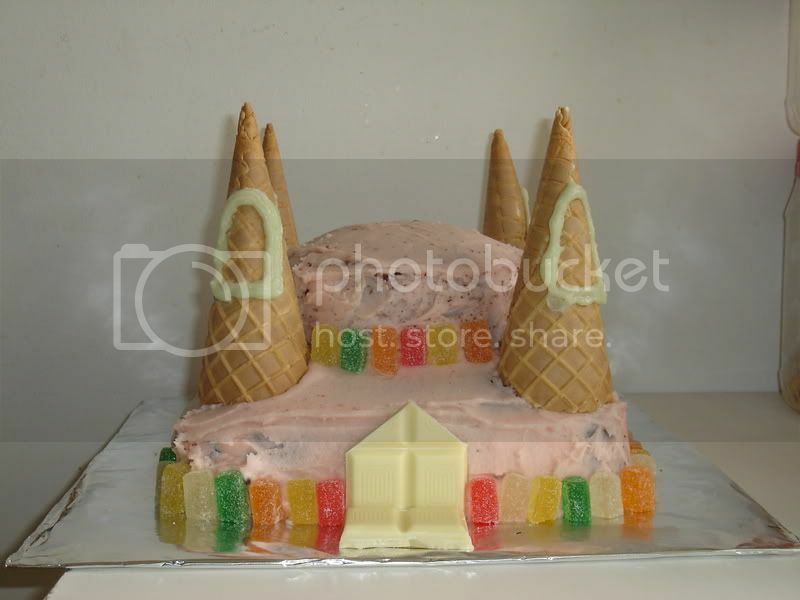 I had to make the icing from scratch and create a castle from the two cake bases I made the day before. 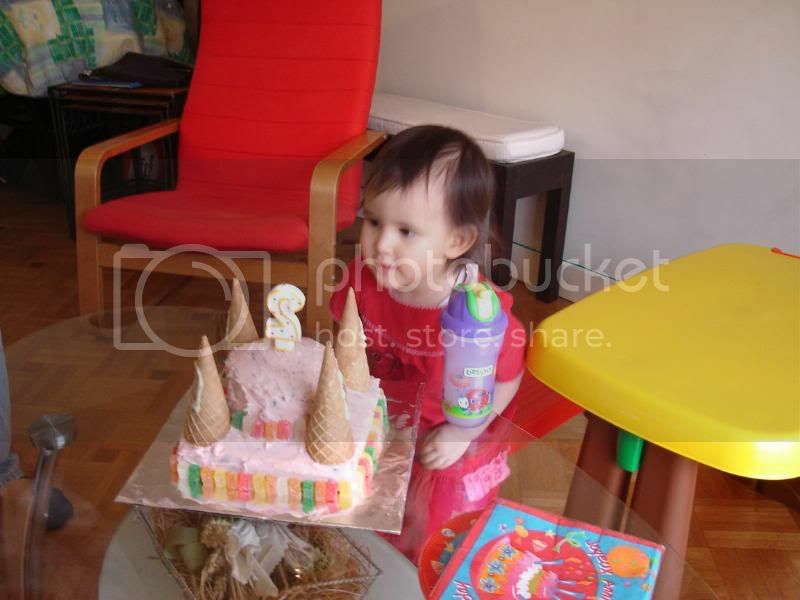 Finally as I was putting the final touches to the cake, she woke up. Since it was another half an hour before Pierre, Caroline and Arik are to be here, I decided she should take the time to open another of her presents, the present from us. Here it is, the play kitchen. I have to admit I was a little disappointed that it is SO small. I was expecting something bigger. Well, this will do for the time being. :-) More importantly, she loves it. 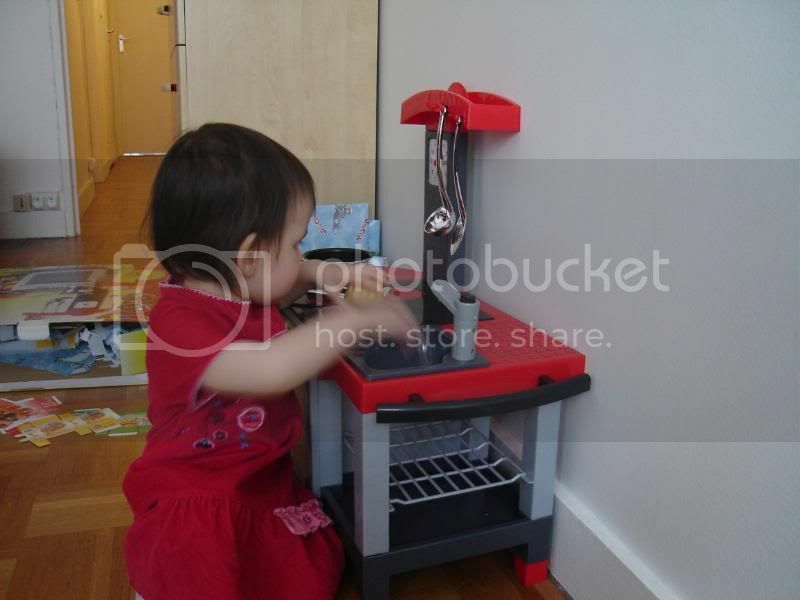 She had so much fun playing with it and was trying to cook some pasta for me. Finally our friends came and it was time for cake! 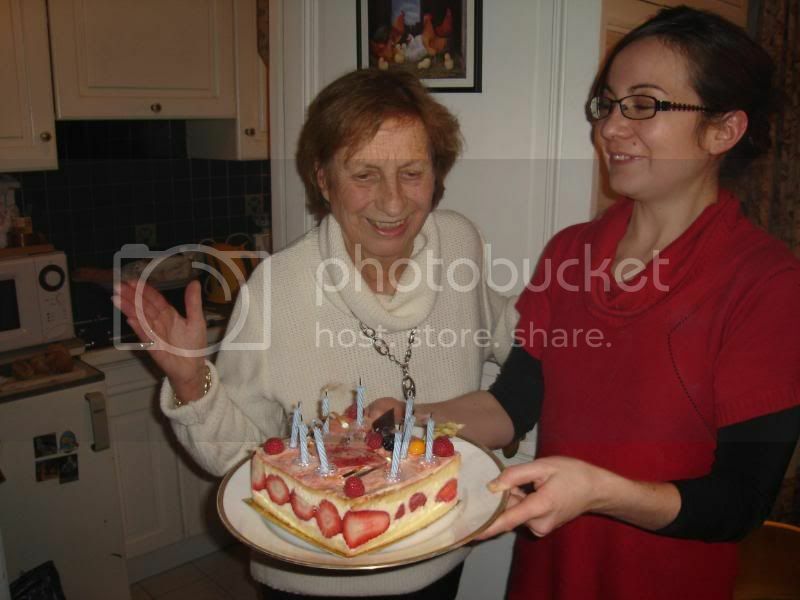 I happily presented my darling with her cake. 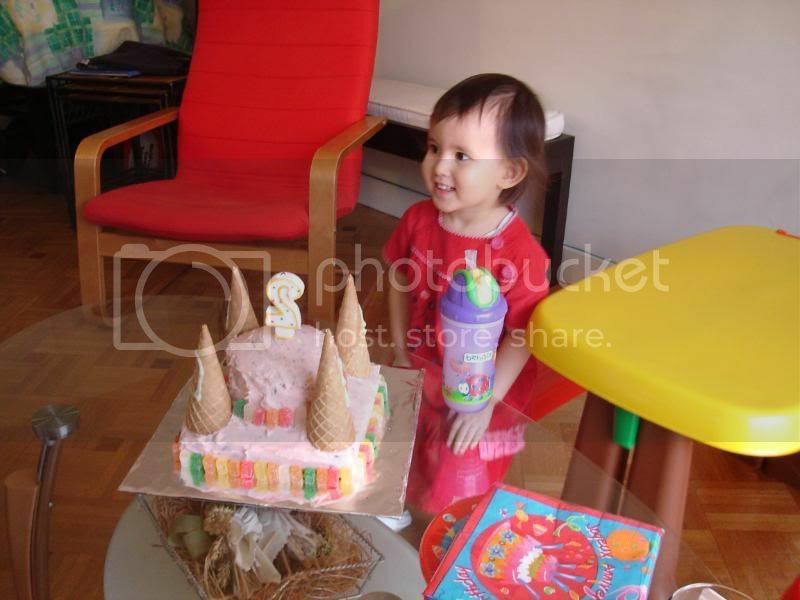 Here she is blowing out her candle and looking all happy. 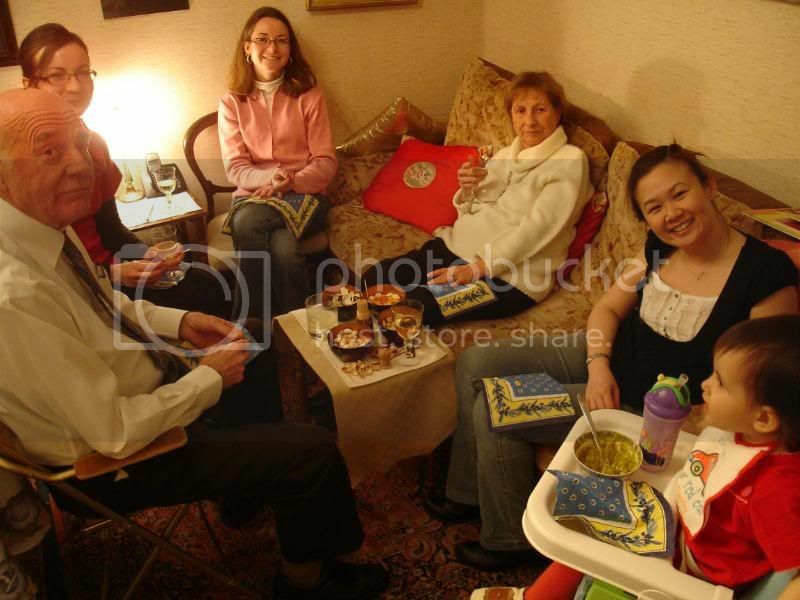 She also received a present from Pierre and Caroline. It was a lovely CD in a book which had English children songs and the equivalent in French. 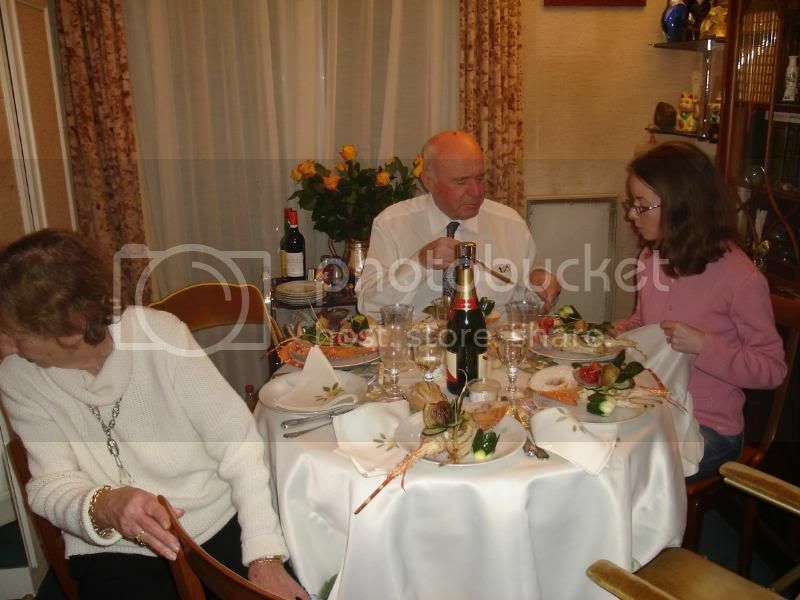 Here is Laetitia and our friends. The two kids had so much fun playing but somehow, I just forgot all about taking photos of them. I even forgot to take any photo of me and my darling! Or any of Etienne and Laetitia except that funny picture of them vacuuming at the same time. Sigh. The two of them had lots of fun playing with the tent, the kitchen etc. 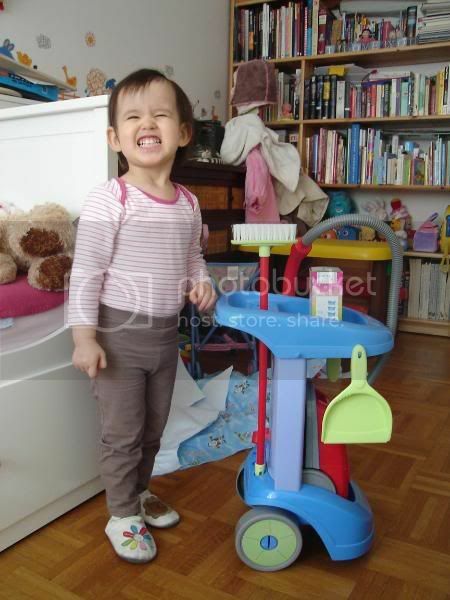 I was very proud of my little girl as she was able to share her toys and would be gracious about it. During the afternoon, Laetitia also opened a few more little presents from us (wooden beads for stringing, doll's clothes etc). And in the evening, we went off to Jacqueline's apartment. 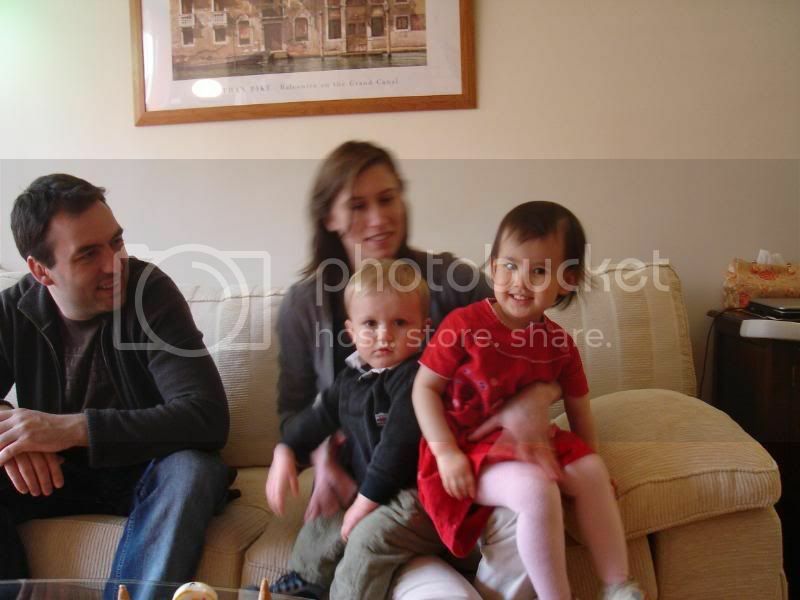 Jacqueline is Etienne's granddad companion and she shares the same birthday as Laetitia. We were invited to dinner. Jacqueline's two nieces were also there. 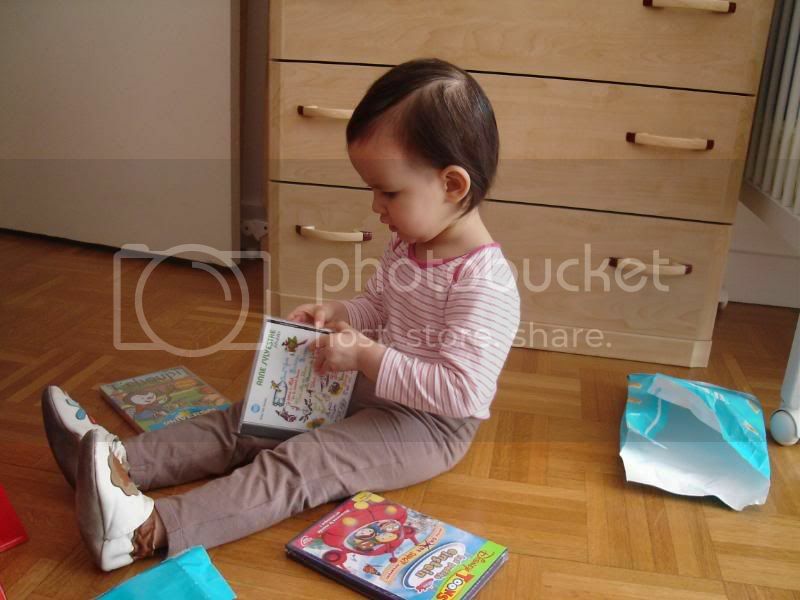 Laetitia received a book each from Jacqueline and her nieces. And we had a srumptious dinner. Check it out. Huge lobsters for starters. And finally a birthday cake for the two birthday girls. And that ends our day. It was almost 11pm and we called a cab, got home just before 11:30pm and put Laetitia straight to bed. What a day. Happy Birthday my darling. I hope you thoroughly enjoyed yourself today. I love you. Happy Birthday Laetitia. I'm sure she's enjoying all her presents. Great effort with the cake, maman. She is definitely enjoying her presents. First thing she said when she woke up this morning was, "c'est ma cuisine!" with a big smile on her face. goodness, i really love your castle cake. I have been wondering what it would look like. Felicitations! I am working on improving my icing/decoration skills at the same time trying out many different cake recipes. oooh... that would be lovely... and er my birthday is in November too... does that mean we get two cakes? I know very greedy! Didn't know you were into baking that much. Interested to attend a baking class with me at Lenotre? Well, I have not baked for 10 years but since I started again recently for Laetitia, she's been enjoying them and asking for more.